Jones Beach looms large in the hearts and lives of millions of New Yorkers. From its windswept beginnings on the far edge of an empire to its 20th-century status as the greatest public beachfront resort in America, Jones Beach State Park has been home to countless memories. This accessible illustrated history tells its story via the personalities that shaped it--charming pirate Thomas Jones, for whom the beach was named; powerful master builder Robert Moses, whose promise to provide a refuge to the "teeming masses" of America's great city drove the project; beloved entertainer Guy Lombardo, who revived the theater and created the elaborate shows; the proud lifeguard corps, and so many more. Period photos show buildings rising, parking lots filling, and the public frolicking. 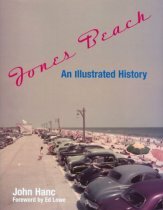 Hanc's attention to detail and the wonderful collection of archival photographs make this a must read for anyone who grew up going to Jones Beach. The foreward is by "Mr. Long Island," Ed Lowe.